Cellulose insulation is plant fiber used in wall and roof cavities to separate the inside and outside of the building thermally and acoustically. The word cellulose comes from the French word for a living cellule and glucose, which is sugar. Building insulation is low-thermal-conductivity material used to separate the internal climate and sounds of a building from external climate and sounds. Cellulose insulation is plant fiber used in wall and roof cavities to separate the inside and outside of the building thermally and acoustically. Is two to three times more dense so it effectively blocks air better than lightweight fiber glass batts. Completely fills cavities, eliminating voids and gaps, which are common with batt installations that can lead to convective heat loss. Mineral Oil: Distillate mineral oil comprises of 1.2% of the product. This is used to keep dust levels down during install or when agitated. The production process utilizes energy on demand, using 1/10th the energy of competitive insulation manufacturers. Borates: Cellulose insulation uses borates for fire retardation. Borates are a mined product.By weight, borates composes 10% of the product. This is used for protection of flame spread. EcoFiber insulation: Every bit can be blown into place or recycled for the next job. Product bags can even be returned for recycling. Free of Harmful Chemicals: EcoFibre is manufactured without formaldehyde, asbestos, mineral fiber or fiberglass. Unlike other products, EcoFiber does not use chlorine based chemicals such as HCFC and CFC that are believed to contribute to global warming. The embodied energy of cellulose compared to all other insulation is by far the lowest. It requires 20 to 40 times as much energy to produce furnace-made insulation (fiberglass) materials compared to cellulose. Cellulose is made by electrically powered machines while mineral insulation is made in furnaces. 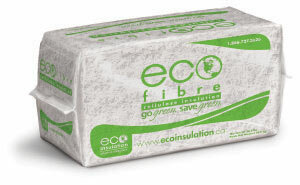 • Ecofibre Insulation demonstrates its effectiveness in reducing air infiltration over fiber glass insulation in walls. • The thermal performance of loose filled cellulose compares favorably to other types of insulation. • Cellulose is very good at fitting around items in walls like pipes and wiring, leaving few air pockets that can reduce the overall efficiency of the wall. • Dense pack cellulose can seal walls from air infiltration while providing the density to limit convection, when installed properly. • The University of Colorado School of Architecture and Planning did a study that compared two seemingly identical test structures, one with cellulose and the other with fiberglass. The cellulose structure had used 26.4% less energy to heat. It also was shown to tighten the structure more than 30%. Subsequent real world surveys have cellulose performing 20-30% better at reducing energy used for heating than fiberglass. • The University of Colorado School of Architecture and Planning did a study that compared two seemingly identical test structures, one with cellulose and the other with fiberglass. The cellulose structure had used 26.4% less energy to heat. • It also was shown to tighten the structure more than 30%. Subsequent real world surveys have cellulose performing 20-30% better at reducing energy used for heating than fiberglass. • Ecofibre Insulation’s thermal resistance, tested in accordance with ASTM C739, measures 3.7 R-value per inch at 4” thickness, tested at 1.6 pcf density. • The density of this natural fibre insulation provides more consistent R-value even under extreme conditions when compared with fibreglass. • Compared to foam insulation, cellulose has a lower R-value per inch, but is much less expensive; foam has a higher cost per equivalent R-value. • Noise reduction is achieved in two ways with cellulose. • The first is that cellulose completely fills cavities leaving few air pockets for sound to travel in. • The second is the cellulose material’s ability to trap air. The significant difference between noise reduction with cellulose and fiberglass is its density. Cellulose is approximately threetimes denser then fiberglass. This helps deaden the sound through walls and between floor levels. • Several installation options allow walls to have a Sound Transmission Class (STC) of 50 or greater. As a comparison, walls with fiberglass batts have an STC of 36-39, depending on stud and screw spacing. • Cellulose’s insulation qualities “can save homeowners 20 to 50 percent on their utility bills”. • The borates in cellulose insulation provide superior control against mold. Installations have shown that even several months of water-saturation and improper installation did not result in mold. • It is a common misconception that the mere presence of crude borates in cellulose insulation provides pest control properties to the product. While boric acid itself does kill self-grooming insects if ingested, it must be presented to an insect in both sufficient concentration and in an ingestible form in order to achieve insect fatality. Proper testing of products containing borates must be performed in order to determine whether dosage and presentation are sufficient to kill insects. Once tested, registration with the EPA as a pesticide is required before a product may be touted as having pesticidal capabilities. • The borate treatment also gives cellulose the highest (Class I) fire safety rating. EcoFibre uses a blend of ammonium sulfate and borate. Although ammonium sulfate is normally odorless, unexplained emission of ammonia and a resulting ammonia smell age 24 has been found in some cases. • Ever since cellulose insulation was first marketed in the 1920s sellers of competing products have raised questions about the safety of the material. These questions are based on legitimate concerns. Cellulose insulation is an organic material. Without special processing organic materials will burn. • Based on full scale fire tests, burn demonstrations, and actual fire data it’s possible to build a convincing case that cellulose insulation makes buildings safer. • In the so-called “Big Burn” demonstration conducted in 1978 the ceiling of the fiber glass-insulated structure collapsed 21 minutes into the burn. The ceiling of the cellulose insulated “house” finally collapsed an hour and ten minutes after the fires were ignited. In just over two hours the fiber glass-insulated building was reduced to smoking rubble. At the three hour mark all four walls of the cellulose building were still standing and the fire had essentially burned itself out. • Cellulose-insulated structures resist fire better, because the dense fiber structure of cellulose, and its fire-retardant characteristics, slow the spread of fire into insulated walls and ceilings. Hot gasses and flames roar right through the open fiber structure of fiber glass insulation. Because of this, many knowledgeable fire officials and insurance underwriters regard properly-installed cellulose insulation as a positive fire safety factor. By slowing the spread of fire, cellulose gives occupants more time to escape and fire fighters more time to save the structure.